yumi’s odd odyssey caught my eye for several reasons. i’m a big fan of platformers, and the game got a rave review from nintendolife. it seemed like the game had a lot going for it, including novel mechanics, a quirky and wacky japanese design, and an old-school level of difficulty, and it’s also the first entry to make it to the US from a series that’s been going since 1994 in japan. the game was originally released as a 3DS cartridge in japan, but is available on the the 3DS’s eshop as a downloadable title. 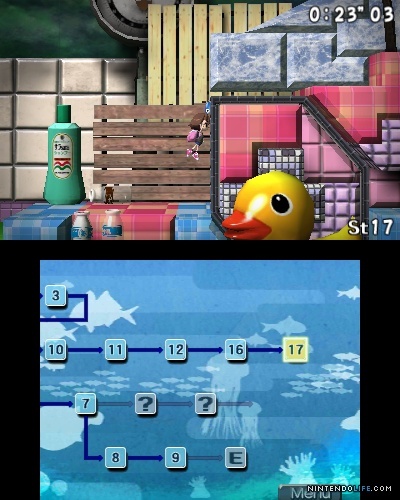 the game’s mechanics completely revolve around the title character and her trusty fishing line. at first the gameplay was pretty fun, and you can use your fishing line’s hook as a grappling hook to help you over gaps you can’t otherwise jump across (rather like the original bionic commando) or climb down to get to a lower ledge. there were some in-game instructions that were a bit unclear, but basically getting to the first ending (which involves about 10 levels one boss fight) is pretty doable since you have unlimited lives and no time limit. there are also alternate characters you can select, one who adds a checkpoint you can return to once and the other who (i think) provides checkpoints and a slow-mo mode that can be triggered at any time and lasts for a couple of seconds. so far so good, but unfortunately it was all straight downhill after that. the game promises some 50 levels, and the lower screen is a simple map that clearly shows which levels have multiple exits. getting to the second exits of the two courses that had them available in order to continue to the next stages was one of the most frustrating gaming experiences i’ve had in a very long time. i don’t mind some old-school levels of challenge, but the leap from the first ending to unlocking the next couple of stages felt like getting pushed off of a cliff — over and over and over again. the problem is that there’s no in-game help or progression of stages to teach or guide you to the advanced moves, which enable you to use your fishing line (often requiring you to master tightening and slackening the line at the right times) in order to propel yourself in ways that don’t initially seem possible, like climbing up a sheer vertical surface or around and up a 90 degree corner, or using the fishing line like a rubber band to propel yourself across huge distances. after hours of repeated attempts i was finally able to complete those two stages, but the entire experience was frustrating and i didn’t feel like i’d really mastered the mechanics; i just felt bruised afterwards. getting to the alternate exits wasn’t just about figuring out how to execute certain actions. if you leave yumi hanging from her fishing line for just a second she completely loses all momentum, which really screws you over and leaves you dangling like, well, a fish out of water. i couldn’t figure out how to regain momentum, and i found it impossible to keep moving in order to keep my momentum going either, even with the slow-mo-for-a-couple-of-seconds feature. often i felt i was only able to get through a section by luck, willpower, and a huge number of retries. the spike in difficulty left me with the distinct feeling that the game assumes you’ve already played through and mastered previous entries in the series. and if the point is that the game wants you to figure out the advanced moves yourself, then the designers are completely sadistic, because the amount of trial and error needed to progress is pretty insane. the game tracks your fastest time and lets you save your replays, and prominently displays your number of attempts, as if that signifies some sort of badge of honor and proof of the difficulty of the game and your tenacity. Levels are made up of what feel like found objects from a stray katamari that recently terrorized a rural Japanese riverbank, with larger-than-life school supplies, picture frames, vegetables, clothespins, sake bottles and pay phones scattered on and among the floating platforms. It’s also never quite clear if these objects are giant or if Yumi’s just very, very small, creating an Alice in Wonderland effect that fits the game’s dreamlike aesthetic perfectly. While the controls are simple and responsive, an uncompromising physics model means that graceful control of the game’s swinging techniques will not come immediately. Out of this, though, comes great scope for advanced techniques through full utilization of the physics. Perfect execution of techniques such as the one- and two-step rocket jump are required both in later fields and for those who intend to improve their field completion times. what the heck is the “rocket jump”?? i have no idea. while there were moments where i felt like i was navigating with spiderman-like ease, as i mentioned, it feels like even beyond mastering the mechanics the game is way too focused on “try and die” gameplay, which i can’t abide. it’s for that reason that i’ve placed the game amongst my rare, lowest-ranking category of games. it may be that some day i give it another chance, but that’s not likely to be anytime in the near future.